Birthday Celebration is one of human's best physiological inventions, you become a year older officially and it's a moment of sadness but see what happens. Then to make it even more wonderful Facebook came along. I was overwhelmed by the number of greetings I received. I would like to thank everybody who took time out write those words to me, even those very lazy ones who managed to type: "HBD". I have never seen a Birthday cake with my name written on it ever, I am not saying it's necessary but as a child that would mean a world. Growing with rich cousins was heartbreaking especially on occasions like this when they have big parties and cake and no one remembers my birthday. Now I can afford a cake but the cake-loving excitement is gone with the age. There is this warm saying, "Friends are family we choose for ourselves" that redefined my life in last many years. Dechen called me in the morning and sang the whole Birthday song. She has very bad voice but it was magical. Dawa Knight and Paday walked in with a surprise package each and it turned out that both came with cakes, they were pissed with each other but I am happy. 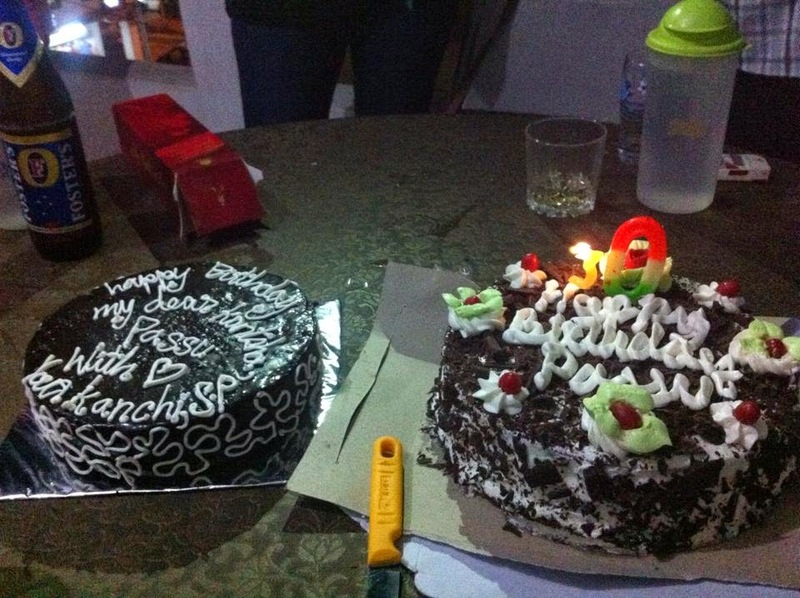 Wa, two cakes for a man who haven't had one in a life time- quite an irony. It made me blush. Thank you endlessly.